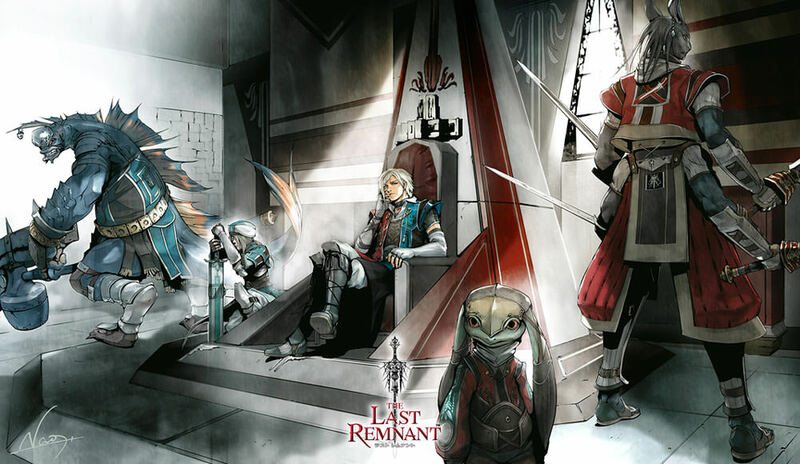 The first Unreal Engine game produced by Square Enix, The Last Remnant was an extremely unique RPG when it first released in November 2008. 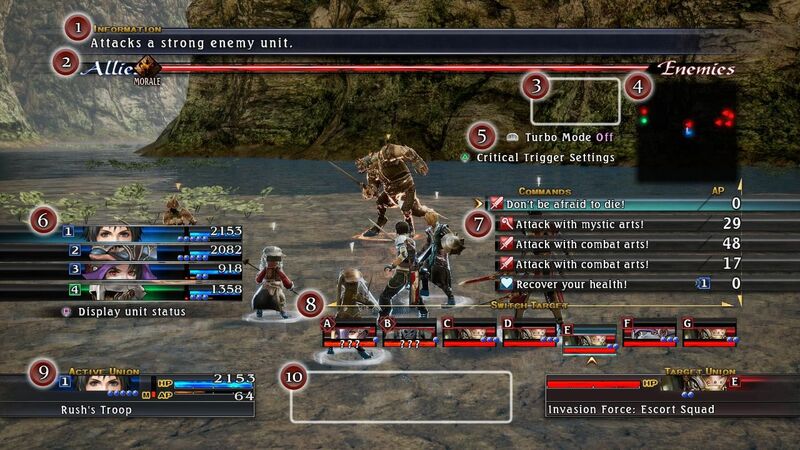 Battles in this game are large-scale fights, where you command up to 18 party members in strategic, turn-based combat. Morale, formation, positioning, group composition, and ability synergy are all important factors in emerging victorious. Please note that, barring some big changes from the original game, TLR has a lot of missable content. To that end, I've written a one-page cheat sheet, taken from various guides and tons of wiki pages, that shows you what you should do before each major story beat. If you don't want to use the guide, some quick tips: talk to everyone you can in every town and pub between major story beats, take every exit from different areas if multiple exists exist, and try to do every side quest as it comes up, even if some powerful bosses are guarding the way. The game is set in a world of Remnants: mysterious and powerful artifacts from a bygone time. Remnants can be of virtually any shape, size, or form, and each exhibit a unique quality or ability. Four races inhabit the game's world: the mitra (humans), yama (large, fish-like), qsiti (short, frog-like), and sovani (four-armed lynx-like). Though they largely live in harmony, there are also those who seek to use the Remnants for their own ends. Emma Honeywell: The one you wish you were playing as. An all-around badass swordswoman whose tolerance for ineptitude is paper-thin, she's the head of a family who have protected the city of Athlum for centuries. David Nassau: Pronounced "dah-veed". Athlum's ruler and an all-around stand up guy, coolheaded enough even to make friends with Rush. Bound to the Gae Bolg, a remnant of devastating power. His four Generals are Emma, Pagus, Torgal, and Blocter. Pagus: An intelligence-gatherer with countless sources informing him. Astute and reserved, but his mage-focused abilites pack a punch. Torgal: Though it is unusual for a sovani to partner with others, Torgal is both a trusted adviser to David and a powerful presence on the battlefield. Blocter: Imposing even for a yama, Blocter is nevertheless a passionate and kindhearted soul...outside of combat, at least. Irina Sykes: Rush's sister, kidnapped by a man wielding a flying Remnant in an attempt to harness a mysterious power that resides within her. With Rush's parents many miles away, it falls to Rush himself to try to find her. Mr. Diggs: A creature that joins you early on, Mr. Diggs can harvest materials for you at certain places around the world. His skills eventually improve as he goes, and the number of times he can dig per outing can be increased by feeding him valuable Morsels. The Conqueror: The game's main antagonist, seen above: a nigh-unstoppable, red-robed figure of immense strength who suddenly appeared one day. Alongside his lieutenants, Roeas and Castanea, his goal is seemingly to acquire as many Remnants as he and his army can get his hands on. The Seven: Servants to the Conqueror, these seven warriors will eventually stand in your way. Each one on their own is powerful enough to pose a serious threat to your forces. Jager: Part of the organization who kidnapped Irina. Bound to Lob Omen, a flying Remnant. Though cunning, he's also grown irritated about his new position looking after Irina. Duke Hermeien: A manipulative leader who rose to power playing various factions off one another. With the rise of the Conqueror, however, he may be biting off more than he can chew. First off: a quick primer on field controls. By pressing R2, Rush will say "Let's do this!" and a circle of a certain radius will spread around him. Any enemies inside that circle will be drawn into battle. Early on, Rush acquires a power called Timeshift, which lets him essentially pause time and run around for a short while. Any enemy within Rush's battle radius during Timeshift will be "tagged" and will participate in a battle if you initiate one with R2 before Timeshift ends. If Timeshift runs out, the chain of enemies will be broken and you'll have to wait for Timeshift to recharge (about 10s) before you can use it again. Don't be afraid to use Timeshift to make a hasty retreat if need be. 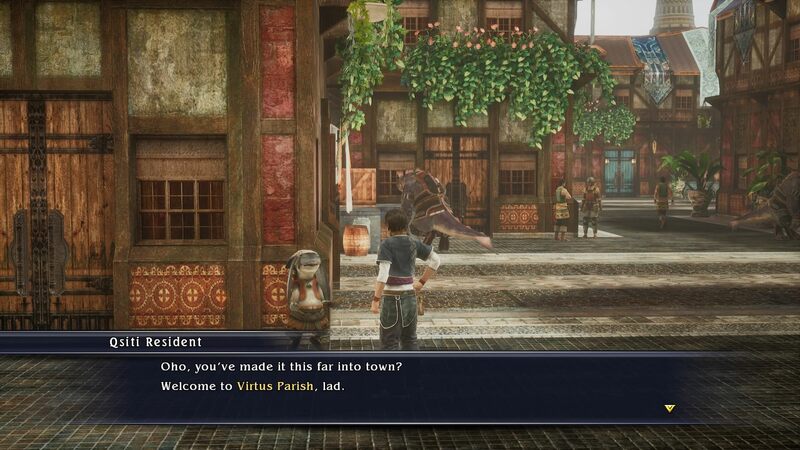 In The Last Remnant, you don't control individual units, but rather issue general orders to groups of units, called Unions. (You can see who will end up doing what by pressing Square while highlighting the command.) Unions can have up to five units; you can also choose their formation, which will give them bonus stats or other unique buffs. Units use abilities called Arts. There are four types: Combat Arts, Mystic Arts, Item Arts, and Special Arts (which are unique to the character). Skills level up as they are used, either increasing in rank (from I to V) or by becoming another, more powerful Art entirely. You can manually disable any Arts that you don't want characters performing, which will allow them to focus on developing a single skill instead of slowly leveling a ton of them. Morale is a key component to battles. The big bar up at the top shows you how good your Unions feel about the battle. High Morale means you'll deal more damage (and may even unleash unexpected moves), while low Morale will make you less effective in battle. Starting a battle against a tough foe may give you low Morale at the battle's outset. Outsmarting the enemy in battle, unleashing Critical Strikes, and defeating enemy units will all increase Morale. There are also some moves that can affect the bar directly, like Bluff or Mixed Message - they're very useful to learn. 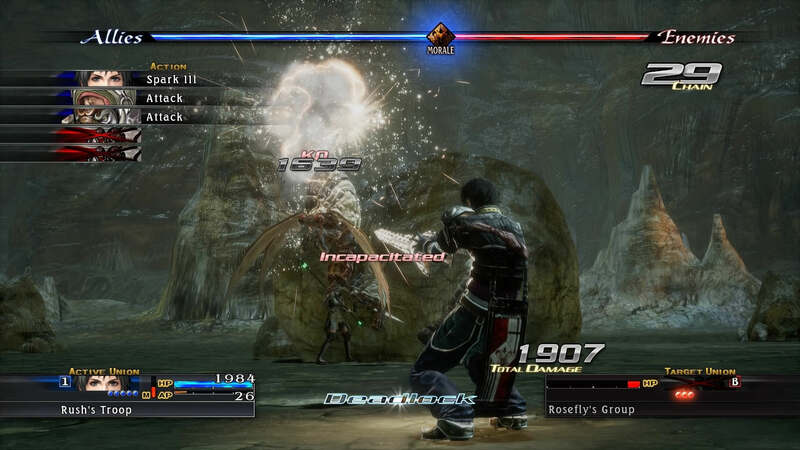 Battles also feature quick-time events in the form of Critical Triggers. You can set these to Automatic if you just want to see the battle play out. They have an 80% chance to succeed in Auto mode. Union positioning is important! Check the minimap during battle to see where your units are located versus the enemy. If you used Timeshift to chain multiple enemies together, the formation of the enemies vs. you will be about how it was on the field before the battle started, so be sure not to surround yourself with enemies before you pull the trigger. Combat is turn-based; you have as much time as you like to think things over. The following are some important terms about battle that show up a lot. Familiarize yourself with them and the battle system will make a lot more sense. Deadlock: Two opposing unions are engaged in close combat. Deadlocked unions are shown within circles on the minimap. If a deadlocked union decides to attack another union, they open themselves up to bad things like Raidlock. Also, some unions are big and/or strong enough to deadlock multiple unions; this is known as Multi-Deadlock. Raidlock: A union surprise-attacks another union for bonus damage. This usually happens when one union breaks deadlock, or if a union performs a long-range attack, and another union takes this opportunity to rush them. Flank Attack: A union attacks the left or right side of an already-deadlocked union. Deals a good mount of bonus damage. Rear Assualt: A union attacks an already-deadlocked and double flank-attacked union from behind. Deals a large amount of bonus damage. Massive Strike: A union attacks a deadlocked, double flank-attacked, rear-assaulted union. Deals a huge amount of bonus damage. The Information bar describes whatever command is currently selected. The Morale meter shows you the overall morale of you vs. the enemy. Get it as blue as possible. Not pictured in this shot: the Chain count, which shows you how many enemies you've defeated. The minimap. Use this to more easily plan your unions' course of action and catch the enemy off guard. Here you can toggle Turbo Mode (2x animation speed) or adjust various battle settings. The status of your all your unions. Green unions, like the one pictured here, are allies and will act on their own. A list of commands you can give the current union. Press Square to replace the Union Status window with the moves the union will perform. The target selection window. Switching targets will change the commands available to a union. Diamond symbols (e.g., unions A and B) indicate bosses. A more detailed look at the current union, vs. the currently-targeted enemy union on the other side. You can't see the exact HP of Boss unions, but they will still flash red when they're in critical health just like a normal enemy union would. Not pictured: if the currently-selected union is in a variant of Deadlock, it will be displayed here for convenience. Occasionally, ordering a Union (with no ailments and sufficient AP) to perform a specific combo of abilities will instead result in an even more powerful Arcana being cast instead. You'll know this happens when all the characters' action queues say "Synergy" over their intended moves. Arcanas hit all enemies (and usually for substantial damage), so they're well worth trying to learn. And even if you don't, you might just get lucky and trigger one every so often anyway. Sometimes you'll see that one or more of your teams' status bars has a fiery background. This means they can summon forth an extremely powerful attack (usually a Remnant) to help out. David's Gae Bolg, for instance, deals major damage to all enemies, but some can even do things like summon a Remnant ally, adding a special guest Union to the battle. There are no experience points in TLR. Characters grow stronger after battles according to both the commands given to them and the actions they perform. This growth can affect not only their base stats but also their abilities and even their job class. If you want to ensure that a party member grows into the type of character you want, you can disable the usage of individual abilites on their stats screen. Lastly, there's a system called Battle Rank (BR). It goes up as you win battles; however, a higher BR means your foes will generally become tougher. As Blocter advises you early on, try to fight lots of enemies in a single battle. Not so much as to overwhelm your forces, of course, but do try to constantly push your limits. In general, you WANT to keep your BR as low as possible, because some boss fights will be pure hell if you don't, trust me. For a much more through look at BR, check here. I know, it really is a lot to take in! But if you have any questions, that's what this OT's for, so don't be shy. Metacritic: TBD | OpenCritic: ? Q: My party member(s) just asked me to give them a weapon or search for an item! Should I say yes? A: Unless you plan on using them yourself (and you usually won't), say Yes. They're essentially asking for stuff that can make them more effective, and since you can only ever change Rush's equipment, it's a golden opportunity. Don't be afraid to look up their requests in the game's extensive unofficial wiki if you're unsure. Q: I last played this on the Xbox 360. How does this version stack up gameplay-wise? 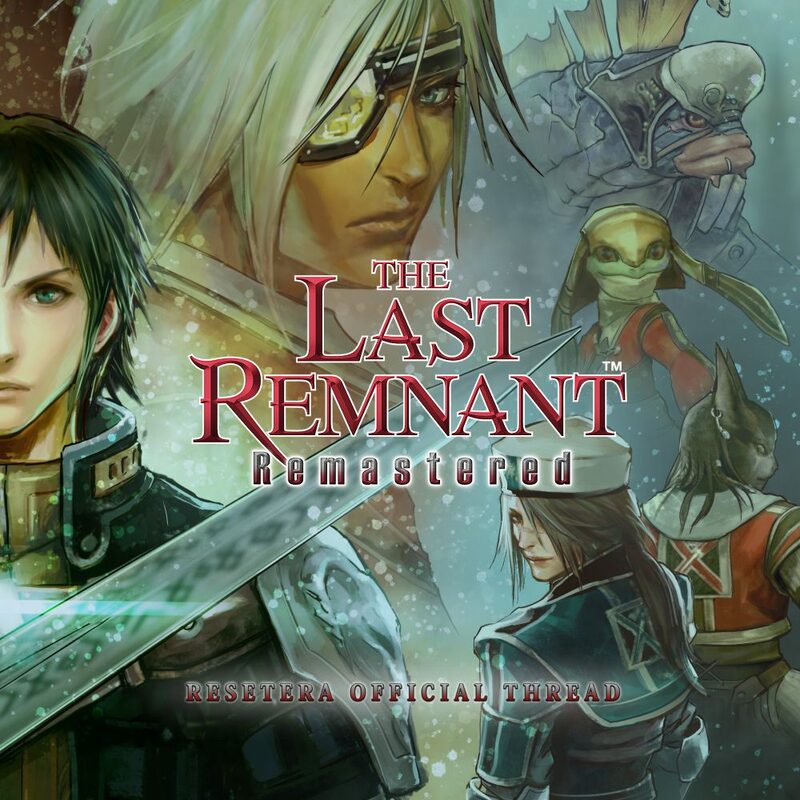 A: The Last Remnant Remastered is based on the much-improved PC version of the game, which overhauled pretty much every aspect of the 360 version and added in several new features. More info is available here. Q: Does the PS4 version contain any further gameplay improvements from the PC version? A: The differences between the PC and PS4 versions are mostly cosmetic. There are a few new features, like a speed-up function for Rush in the field (sort of like FFXII The Zodiac Age's speedup, except it only affects Rush). More will be added here later as it's discovered. Q: What are the graphical improvements? A: The jump from UE3 to UE4 has enabled the game to have a new lighting system. Cutscenes also appear to have been re-rendered and look more vibrant. The texture pop-in that plagued the original game also seems to be gone now. The game's UI and assets, originally designed for 720p resolution, have also been redrawn to at least 1080p. Q: Is there a demo for this game? A: It is unknown whether the PS4 version will have a demo (my guess is no). If you have a non-toaster PC, however, you can still download a free demo of the game here. Be warned that it isn't a very good demo; it kind of just throws you into the game and assumes you more or less know how the crazy combat system works. It's a taste, though. Q: Speaking of the PC version of TLR, it was taken down for sale from Steam. :( Is TLR Remastered going up in its place? A: We don't know for sure, but it's highly likely. The original game went down to a base price of $9.99 (whereas TLR Remastered is $20), and Square will likely want to sell a PC version for that price as well. I can't watch videos right now but does the game support dual audio (japanese/english) ? Nice OT! Looking forward to playing the game tomorrow. Trophies are identical to 360’s achievements. The game came out a week after my first RROD, I was so salty that I sold my 360 shortly after, so I've never played it. It still holds up in 2018? Curious to hear opinions on the improvements. I own it on PC, so I'm not so quick to pull the trigger on this remaster. 182 hours listed on Steam, will probably go for the Platinum. The PC version had dual audio, but that's unfortunately all I know atm. Fingers crossed they give this version every language/audio option the PC version had. guess im holding that big fat L for buying the game day1 on steam. thanks square. Because they remastered it 9 years later? its just a update they could have given owners of the game. that too much to ask? Give it a few months and the game will probably be back on Steam. A game I've always wanted to play! Looking forward to it! Is the game’s gameplay convoluted and can make it impossible if you miss out something? It definitely is a much more complex battle system than most. I hope my writeup will make it "click" for as many folks as possible though! and can make it impossible if you miss out something? No, if you miss out on something in TLR, you just...miss out. (Until New Game Plus, that is.) You can, however, make the game very difficult by fighting too many battles with too few enemies. Chain together a bunch of mobs and fight them in one big encounter to keep your Battle Rank low, and the game's boss fights will be much easier as a reward. Why Square delisted this on PC if it's PS4 only? Most likely, they're going to put TLR Remastered up on Steam in the near future. They delisted the original because its base price went down as low as $9.99, versus the $19.99 they're charging for this. No concrete information on if/when it's coming to Steam or whether there will be any loyalty discount. The gameplay is very convoluted, but I don't think there's much you can miss, the original Xbox 360 version was a bit messed up because people mistakenly did the usual JRPG grind on weak enemies..which didn't increase their stats much but raised their Battle Rank, which basically made the game harder and harder. The PC version rectified a lot of that though. The game is based around Units and Unions. Units being individual characters, Unions being squads of Units. This was another problem with the 360 version, you were limited in the number of unique leader Units, so you had a handful of these interesting looking characters with their own little stories, and the other 2/3 of your force was generic grunts who shared a model and had palette swaps. In the PC version you could have your full 18 Unit force(Starts lower, increases as you progress) as Unique Leaders. Each Unit has their own abilities/equipment and level up as you fight, you can arrange these Units into Unions as you see fit, between 1 and 5 Units per Union, you then arrange them in formations which have stat buffs. Union names will change based on the 1st Unit in the Union. Skills level up as you use them, so use "Knee Splitter" a bunch and it'll turn into "Knee Splitter II" then it'll unlock "Cutting Lunge" > "Cutting Lunge II" > "Blue Streak" > etc > etc. Stats increase as you do things, so do physical damage, STR increases, take damage, DEF or HP will increase, etc. 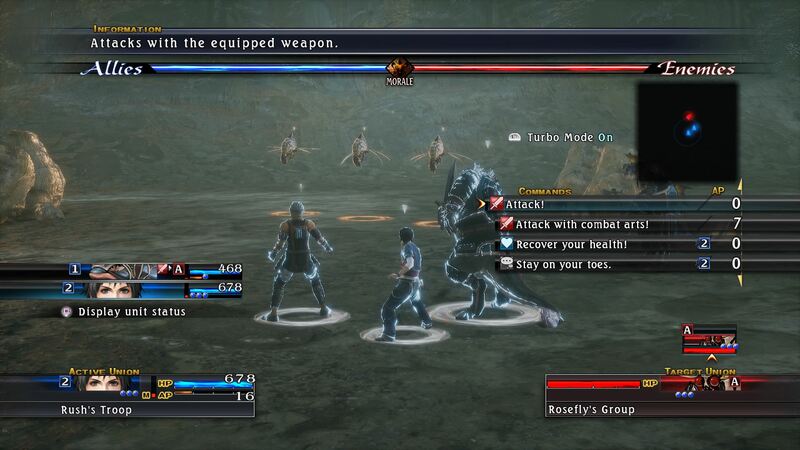 There's also RNG involved with the combat, the abilities each unit can use is a bit random. You can tell a Union to do all Physical attacks, and each Unit in the Union will do either a standard attack or one of their physical Combat Arts, same for Magic Arts, you can tell them to Keep their HP up, anyone with a healing skill will use that while anyone that doesn't will attack. There are very few missable things, but there are a couple of points of no return where once you start it, you can't go back..so rotate those saves! The best tips I can give new players are focus on a weapon type, you can do it all, but the higher tier Arts are much better than the rest, so stick with one til you max it out. And secondly, Item Arts consume items, Vivification Herb (one of the resurrect skills) needs materials to use, as does Healing Herb, make sure you have plenty of materials on you at all times. These are both very good tips that I mostly missed. Will incorporate those into the OP. There's no real reason to buy this if you've already own the PC version, huh? Doesn't look like they changed the BR system much (if at all)... that's a shame, it was a big time annoyance in the previous version (trying to all avoidable battles and having to fight some bosses at low BR so the later game was impossible was very difficult). I played this for a while on Steam, but I was never really sure what I was doing in battles. Might pick this up. Judging by a few of the videos released, it appears to be 60 FPS in the field and in battle. Cutscenes are probably still 30 though, just like the PC version. Not much, no, as the developers said they didn't really change anything. (There are, however, a few videos surfacing of a few new minor features, like a speedup option for Rush in the field.) TLR Remastered also has a fairly high chance of coming to Steam sometime down the road, so you're probably better off waiting for that instead if you want to see what the game looks like in UE4. I had an absolute blast playing this on Xbox 360. Pretty fun game. i think the combat is fairly straightforward, it's the weapon upgrades that are strange and that you can miss out pretty easily on if you like to get the best weapons for each character. Will probably get this on ps4. This is based on the PC version which fixed a lot of that isn't it? If you loved this on 360, this version is going to be a serious treat. They overhauled everything for the PC/PS4 version, adding in a ton of quality-of-life changes plus stuff like autosave, NG+, Turbo mode, new abilities/formations/classes, no leader limit, etc. It's a much better version of the game. How large is the download for us poor bastards with a 150gb data cap? Won't know until the game's available. Should be in less than 3 hours. AU PSN Store says 11.89GB File Size. Steam version is 12.2GB installed. Just checked the AU PSN store and...there's no dual audio. Just English. Why? Oops, I thought it came out already. 12gb isn’t too bad, hope that’s true. Resonance of Fate being enormous on PS4 stopped me from buying the game despite wanting it. Is the weird battle rank system still in this? My only qualm. Just watched someone’s stream and yeah, the game’s English only. Bummer :/. Depends on what you mean by "the weird" BR system. Do you mean the system as it was on the 360, or just the general existence of the system itself? If it's the former, good news: the BR system is quite a bit better on PC/PS4 than it was on 360. Just don't play too 'carefully' (i.e., use Timeshift regularly to chain mobs together) and you'll do just fine. Oof, won't bother then if so. during the early stages of the game. There are a plethora of quality of life mods out for the original PC version. INI tweak to allow manual party equipment - Gives you full control over everyone's equipment. Battle Rank scaling mod (variants include static, dynamic, etc) - makes the game harder or easier. Random encounters will be considered hard encounters so you will rarely hear 'Sword Sparks' if ever. TLRPlanner - Companion program that hooks into the game and tells you what quests are expiring among other things. It does a lot more cheaty things with memory like forcing rare mob spawns or directly teleporting you to treasure chests or points of interest. RemnantTrainer - cheat/trainer that allows you to modify items, your inventory, equipment stats, etc. Let's you fix a unit's stat/class branch. There are a few more minor utilities here. None of these are possible on the PS4 version. If they ever release the remaster on PC, the modding scene (if it's still around) will have to remap all the memory addresses for those mods. Still wondering why they are releasing this on a Thursday... Been looking forward to this for awhile, never could get this running on my PC back in the day. Was this game any good? I bought it once for 5 bucks but I never played more than an hour I believe. So if we already own this on PC are they offering any upgrade option for existing owners? Are there any comparison screenshots? I'm really curious about this game and that price point is a great bargain, IMO. Nice OT! Excited to play again. I only ever played on 360 and got stuck on Disc 2. I might need some pointers. Any recommended material to look up? What a glorious OT. This game definitely deserves a nice one. Yes. It's one of the core mechanics of the game's combat (your "strength" goes hand-in-hand with the number of victories). It just needs some serious balance adjustments, but unfortunately that seems to be outside the scope of this remaster. The game's not even coming to PC (yet?). They haven't said a single thing about it, other than the statements they made when removing the original version from sale (which left the door open to eventually releasing the remaster, returning the original to sale, or doing nothing). My suspicion is that there wouldn't be a discount if they ever do put in on Steam (we are talking about Square here). But it's only $20, and the game is easily worth that.